Eleven elementary schools in the San Diego Unified School District have been designated Distinguished Schools by the California Department of Education, including Dingeman Elementary in here in Scripps Ranch! "This is truly a great honor for these schools, their students, principal, staff, parents, volunteers and the entire community," said Superintendent Bill Kowba. "It's not easy to become a California Distinguished School. It requires great scores and a commitment by the staff to go through the lengthy state process." The state makes the awards to elementary schools on even-numbered years, middle and high schools on odd-numbered years. "The schools we are recognizing today demonstrate the incredible commitment of California’s teachers, administrators, and school employees to provide a world-class education to every student, in spite of the financial hardships facing our state and our schools," said Tom Torlakson, State Superintendent of Public Instruction. "Their dedication is inspiring, and I applaud and admire their passion and persistence." 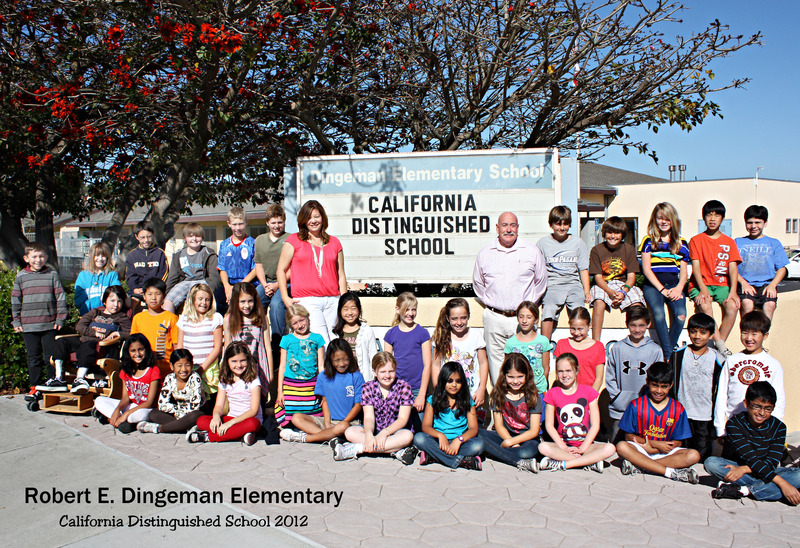 Dingeman Elementary is located in the Miramar Ranch North neighborhood of the Scripps Ranch community and is proud of its community connection: it is named after a local civic activist Col. Robert Dingeman. The school's API exceeds 900 and the school mixes high academic standards with acknowledgement that supportive and involved parents, teachers and community members are all partners in education. 100% of Dingeman's 5th grade students scored "Proficient" or "Advanced" on their 2011-12 standardized Science tests -- only 14 other schools in California can make that claim. With a dedicated team of more than 300 volunteers, parents and community friends help in classrooms throughout the campus and with special events, such as Art Corps, which includes a school-wide, Annual Student Art Show, Family Math Night, Book Fairs, and Family Art Night. Dingeman's innovative "Rockin' Science Program", another enrichment program, enables students at all grade-levels to receive additional instruction in science from two part-time science teachers working out of a dedicated lab. More than 400 students participate in the before-school Cardio Club, with runners learning important fitness and life lessons. The school also has a dedicated media center with a computer lab, offers GATE and Seminar programs, and promotes the active engagement in philanthropic, hands-on, student-led projects that enhance our local and global communities. Parents, teachers, and administration work as a team via the Family Faculty Connection (FFC), School Site Council, and Site Governance Team. The school's active FFC sponsors grade-level assemblies, award-winning Honor Choir, Band and Orchestra, Safety Patrol/Parking Patrol, classroom mini grants and instructional supplies. They also support field trips to theater performances, historical sites and museums, floating biology labs, and math and science institutes promote artistic expression and communication and provide a rich and varied educational experience. With its active parent and staff involvement and team approach, the school also coordinates an array of annual social events designed to foster a sense of school pride and community, including Family Fun Night, Father-Daughter Dance, Spring Carnival, and Mother-Son Night. Over the past 5 years, four Dingeman teachers have received prestigious "Thank a Teacher" awards in the Time Warner Cable-Mission Federal Credit Union county-wide sponsored contest which recognizes excellence and dedication in the field teaching. Since the recent announcement, many emails, phone calls, letters have commended the school for their award. Mrs. Kimie Lochtefeld, school srincipal, states, "We are extremely proud of the accomplishments of our hard working students, our committed and talented teachers and all the families who send their child to our school. We could not do this without the positive relationships we have formed here at Dingeman. We are a family and take care of each other. I am honored to be able to serve in such a fine school with families who are actively engaged in their child's education." The school had a site validation visit to observe the two signature practices being implemented in the school. The two signature practices will be uploaded to the California Department of Education website so that other schools can replicate these strategies for improving English Learner student performance and community involvement. As recognized by Superintendent Kowba, "Congratulations to you and the entire Dingeman community for achieving the incredible milestone of California Distinguished School! This is the Oscar Statue, Olympic Gold Medal, and Super Bowl Championship all rolled into a singularly special recognition in K-12 education. I could not be prouder of you, the staff, parents, and most importantly the students. Long hours, hard work, and a collective laser focus on academic excellence by all community stakeholders made this a reality....WELL DONE!"